In Safe Hands is a program aiming to improve patient safety in the primary care in the Danish municipalities and reduce pressure ulcers, medication errors, falls, and infections. The program started in five Danish municipalities in 2013 and is currently being spread to another 13 municipalities. The program introduces improvement methods in the primary care, and it is organized as a collaborative with regular learning seminars, site visits and networking among participants. In Safe Hands is coordinated by the Danish Society for Patient Safety in cooperation with the Ministry of Health and Local Government Denmark. From the beginning, communications were build in as an important part of In Safe Hands to ensure awareness, spread ideas and motivate participants. 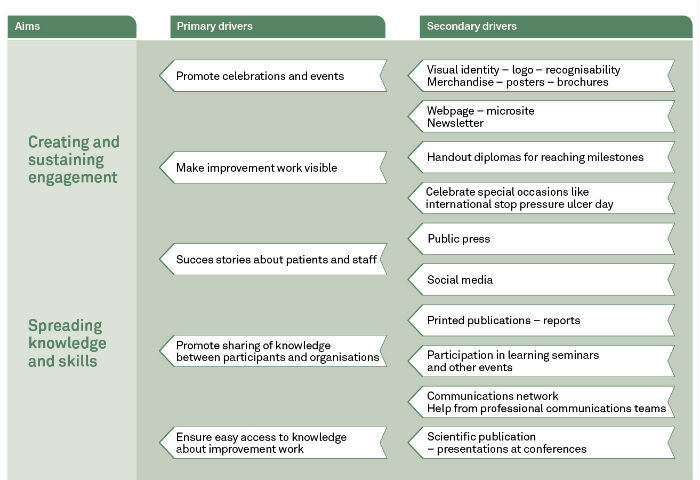 Aims for communications were outlined, and a driver diagram designed – describing how to work towards these aims. A survey was conducted among participants two years after the start of the program. The great majority of respondents agreed that celebrations and mentions in the media can cause a whole range of positive effects, driving the improvement process.